Spend Your Dot Dollars Now! Get what YOU wanted for the holidays! You've earned $125 in Dot Dollars! So for every $50 you spend during this promotional period, you'll get $25 off. You can use as few or as many of the codes/credits as you'd like. 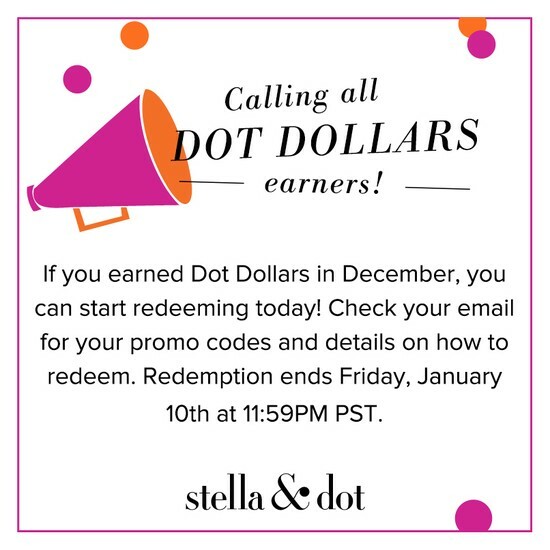 Just go to www.stelladot.com/vaughn to shop, and enter the codes below at check-out. Great way to treat yourself OR shop for friends/relatives birthdays or special occasions! And if you'd like to earn more free product credit, host a trunk show with me in January and earn an extra $50 in product credit!